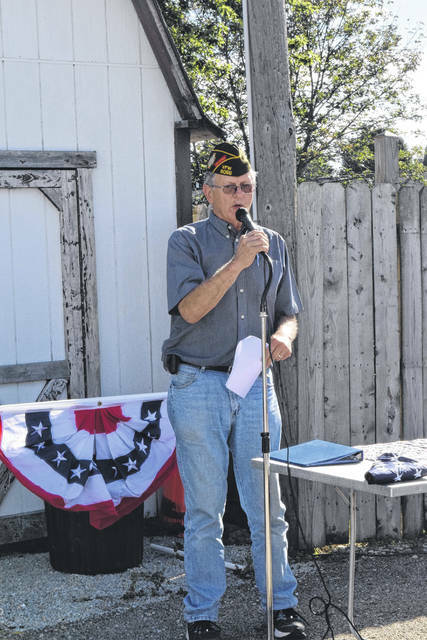 EATON — VFW Post 8066 held a flag retirement ceremony on Saturday, Sept. 15. 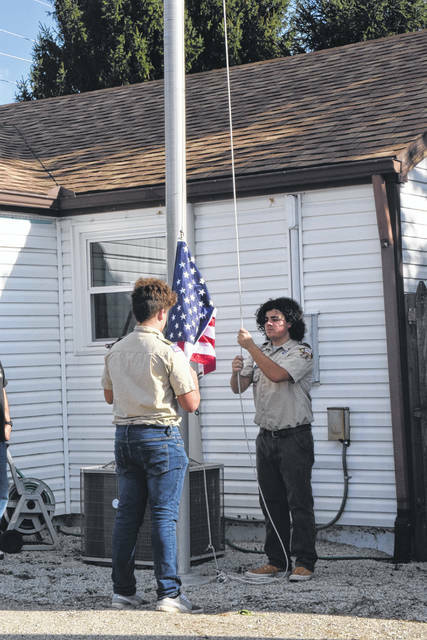 Flags were collected and burned, before a new flag was installed at the post. 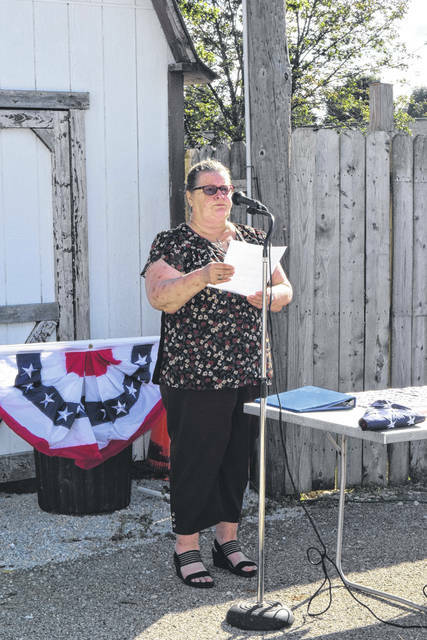 The ceremony opened with Patty Parks from the Post Auxiliary reading song lyrics by Andrew Dean. She read, “The day our flagpole was ready, we had no flag to fly. A mother stepped forward and said I have a flag, with a tear in her eye. It was given to me the day that we laid my son to rest. He was a true blue soldier who gave his life his best. “I got a knot in my throat and a chill in my bones. A tear rolled down my face, a mother has lost her son at war. The pain on her face. In a mother’s eyes you can see red, white, and blue. In a mother’s eyes you can see the pain so true. Freedom comes with a cost of sadness and loss. You can see in a mother’s eyes,” she continued. Next, the unserviceable flag was lowered and folded. Another flag was already cut into strips, with the field of blue cut on its own. 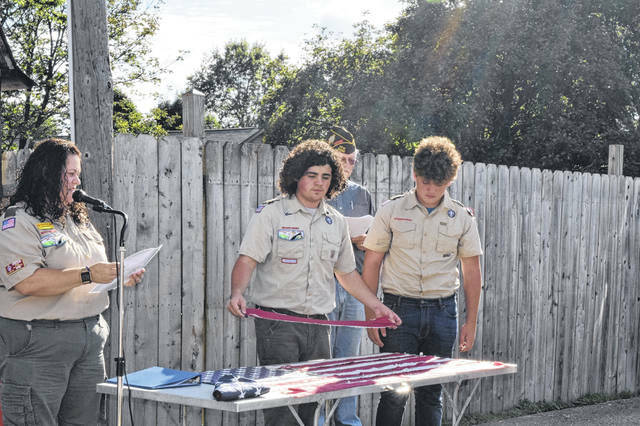 The flag retirement was led by Scout Troop 78. Angie Ketron read, “I am your flag. I appear in many places. I have taken many forms and been called many names. I was authorized by Congress in 1818 in the form you see now and have remained unchanged except to add a new star each July 4th after a new state joined the union until I reached my present number of 50. “I am more than just red, white and blue cloth shaped into a design. I am a silent sentinel of freedom. People of every country in the world know me on sight. Many countries love me as you do. Other countries look at me with contempt because they don’t allow the freedom of democracy that I represent – but country looks on me with respect,” Ketron continued. “I am strong and the people of America have made me strong. My strength comes from your willingness to give help to those who are in need. You strive for world peace yet stand ready to fight oppression. You send resources and offer technology to less fortunate countries so they may strive to become self-sufficient. You feed starving children. You offer a home to anyone who will pledge allegiance to me. “Your sons gather beneath me to offer their lives on the battlefields, to preserve the liberty I represent. That’s why I love the American people. That’s why I have flown so proudly. 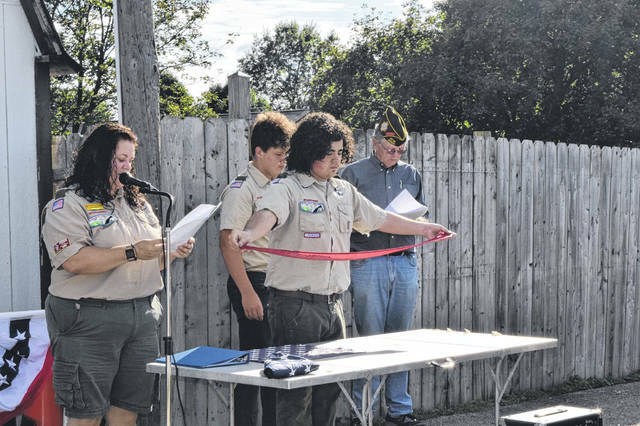 “Scouts and their families are some of my favorite people. I listen to your patriotic songs. I’m there at your flag ceremonies and I appreciate the tender care you give me. I feel the love when you say your pledge. I notice that your hand covers your heart when I am on parade. How smartly you salute me as I pass by and I ripple with pleasure when I see it. Stripe by stripe, by stars the flag was ceremoniously lowered into a bin so it could later be burned. A new flag now flies over the VFW Post 8066.